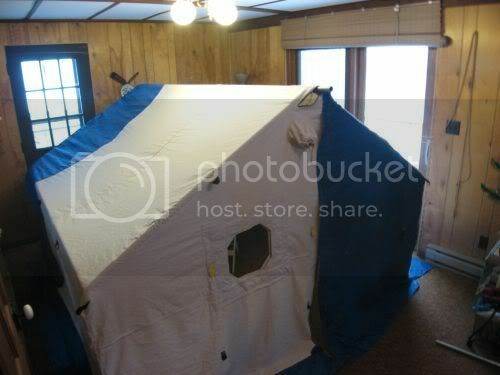 What level of difficulty is involved in making a canvas tent? Can I use pvc poles? I was thinking wedge or tepee style, any suggestions? For my tent I had the benefit of a friend/cobbler with heavy sewing machines. I have a heavier one now but without one you'll learn the old hand sewing awl! As for PVC, I didn't go that route because of cold temps effects on plastic and the weight of my tent. As for tent design/layout, that will depend on you, your camping styles and the friends that come along and how they like to sleep. With my kids along we all sleep with our heads at the window end. With some friends from Montana, after a few days, I sleep outside! I have found an interest in the Stove supported TeePee style made from light weight materials. Of course I envy the appearance of NEW snowtrekker tent. I use mine big tent for four season of camping. I like ventilation! And I like a relaxing common area under an awning. Avid outdoorsman? My son and I snowshoe and winter camp with a four season tent and no stove. When my daughter comes along we drag sleds holding the campfire style tent I made and my military style Yukon stove. We canoe and kayak long trips in the early spring till Thanksgiving. That's my son's and my last float of the canoe season as we celebrate his birthday. My daughter more than my son loves climbing. My sore neck! 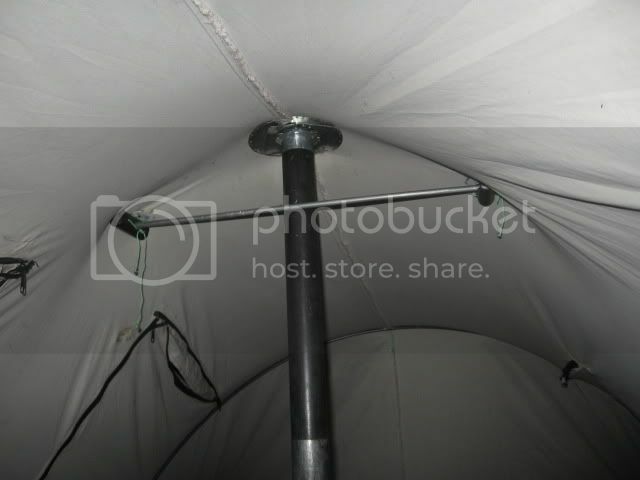 RE PVC poles: I have never heard of tent poles being made from PVC. My guess is they are not strong enough, and will be too brittle in the cold, and crack and fail. 4 season back-packing tent poles are made with high quality lightweight aluminum, and so are Snowtrekker's. Heavy duty steel and aluminum tubing that is inexpensive is available from hardware stores and metal stores, but then you are working with weight and bulk that you probably don't want to haul on a sled. If you travel on public land in out of the way places, you can design a tent where you can cut poles from the bush. (Lean them against a tree for returning for another trip. De-bark for storing in the bush for several years). Wall tents are an obvious time tested true design. But there are other designs you can use wood poles for too. Tentsmiths is a website offering many historical designs http://www.tentsmiths.com/ Have a look at their many models and you might gain some neat ideas for a DIY project. Good luck. A really subjective 2.5 cents on canvas for tents. Canvas tents require a tarp. Canvas tents get moldy if not very well cared for before and in storage. Canvas tents get chewed up by mice if not well protected in storage. Canvas tents are heavy - real heavy. Earlier tent designers only had canvas to work with nothing else. Times and materials have now changed and, on occasion, improved. So why bother with canvas unless you're a reenacter of some type? To me a hot tent is just a balloon for keep hot air in - sometimes from a stove, sometimes mine. Since you'll need to take a large waterproof tarp for canvas why not just take a large waterproof tarp to protect something lighter like nylon? Using wedge or tepee designs and something like Sunforger or silnylon, a tarp isn't even needed. I just spent about 10 hours removing moldy and/or mouse-eaten panels in a canvas tent that someone threw out. It weighted 27 pounds. I've now replaced most panels with white rip-stop nylon. It now weighs 12 pounds and looks weird. A nylon tent in a canvas skeleton. Yes, I know that it would have taken a lot less time to just build a nylon tent from scratch, but I have a tendency to get right carried away some time. Not if they've been treated for water, flame and mildew resistance, as almost all are now. No more so than any other material. Egyptian cotton weighs about double what nylon does, but the weights are close when you consider that EC doesn't need a rain fly. "Regular" canvas weighs roughly 4X what nylon does. So why bother with canvas unless you're a reenacter of some type? Comfort, safety and longevity. Canvas breaths. You don't wake up to dripping condensation. They feel warmer because they're not constantly damp. Canvas doesn't turn into napalm if your stove gets out of control. It doesn't smell like plastic. Canvas doesn't deteriorate after a few weeks in sunlight. 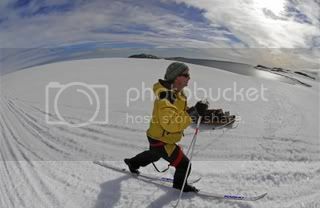 It's not for backpacking, but there's nothing better if you're going by sled, horse, dog, canoe or car. The tipi shape was good for the indians who had to get the smoke out but when you use a chimney the space above at the tipi top has all the hot air that is no good to anybody. For this reason I like a two man tarp or tent to be,a sit down, no higher than 40". So a tunnel shape is best in my opinion, the hot air directly above your head radiates. I think a tarp (canvas or nylon) to be the most adaptable to summer shade or closed in nailed down in a cold storm. The nail holes should be about 3' from the outer edges. A rectangular tarp does the job without sewing or just sewing the tarp, all the material is put to use. I have sewed every shape of tent and it is a big job to cut and fit. There should be no vents in the top, but you do need vents just below eye level when sitting. 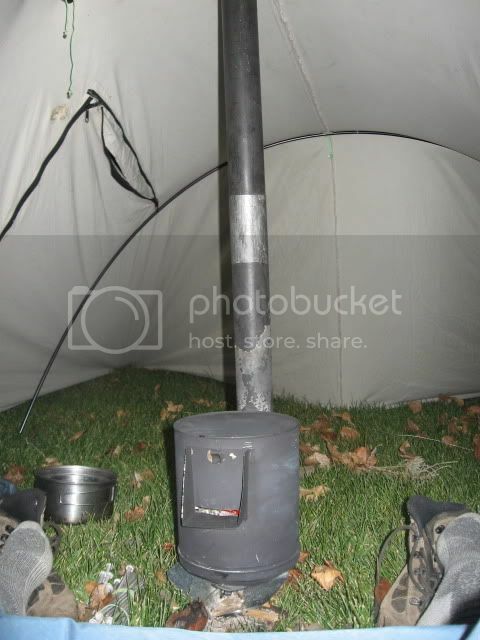 I use my chimney as a center pole and then other poles inside the tent. I do not like outside lines. If the end center poles are the right distance from the ends, these ends come tight across the end, taking up all loose tarp. The ends can be used as entry or nailed tight and a zipper door sewed in the side or end. I do have stong opinions but I am always trying to learn, I do not mind criticism. Hi Obio13, I see you love your canvas. I've been camping in canvas and nylon for the past 50 years, so like you, I've developed a few ideas on both. I have a video of an untreated canvas wall tent being totally consumed by fire in 45 seconds and another video of a fire retardant canvas tent going up in 120 seconds along with great amounts of black acrid smoke. I just went outside and tried to light my uncoated rip-stop nylon. It would not stay lit. It had to have a a constant external flame to burn. Tarps are needed to keep to keep freezing rain and ice off the tent itself. They are also needed to keep large amounts of snow from collapsing the tent. As with nylon, Egyptian and other cotton tents also require a tarp in most circumstances. I can only find one outlet in all of North America for an Egyptian cotton tent and I don't have a thousand dollars to spend on it. The only fire retardant, water repellent, mildew resistant canvas that I know of is Sunforger which weighs just over 10 ounces per yard. The rip-stop uncoated nylon that I use is just under 2 ounces per yard. The only damp nylon tent that I've ever slept in was a small 4 season cold tent but never had a damp nylon wall hot tent. My present nylon hot-tent is 7'x9' with 3' walls and a 6' peak. As everyone can see, the two of us could probably debate the pros and cons of each fabric for ever. So I think we should "agree to disagree" and consider it personal preference. I am about 90% done making my first homemade tent. It has not been field tested, and I am not yet qualified to enter into the canvas/nylon debate, but I will offer up a few opinions on other matters. 1. I found that sewing the tent was much easier than other smaller sewing projects (bike panniers, tool bags, etc) I have tackled. Having adequate space to layout the panels of the tent is important. 2. The most tedious part of the sewing is the second row of stiches on the a lap felled seams. 3. Think ahead when sewing up your tent, try to do as much as you can before joining large panels, it gets more awkward to sew as the panels are joined together. 4. I'm making a hot tent just see if these things are really as comfortable as the conventional wisdom claims. I've done it on a budget as a 'proof of concept' project. The materials I'm using may not be the best, I only put US$60 into the canvas and nylon material. In my case, the nylon is not breathable, I intend to use a poly tarp for a fly. I'm curious to compare the performance of the canvas portion of the tent to the nylon. I've cold tented a bit, and know all about frost build up on 'breathable nylon'. 6. PVC: It might be OK for short pickets (<24") sewn into the corners of a pyramid tent, but I don't think it would be adequate for a long ridge pole, unless you went with Schedule 80 in fairly large diameter. To get a feel for the relative stiffness of the different materials, go to your home improvement store and pick up 10' lengths of pipe, put one end on the floor and try flexing them. Below is what it looks like so far, I probably have about 20 hours in the fabric layout, cutting and sewing. 8'x15' nylon tarp weighs 5lbs. Stove/chimney2lbs. I for one would love to try your supporting chimney idea but without further information on how they are made it is out of the question for me. Are you planning on marketing them or something? I would like to fix you up with a stove/chimney, but I would like you to make as many parts as you can. Have a look at the parts that are easy to do. stove body with baffle, the door and door jam shown has some spotwelds but pop rivets would work. Stove jack; Round plate goes on top outside. 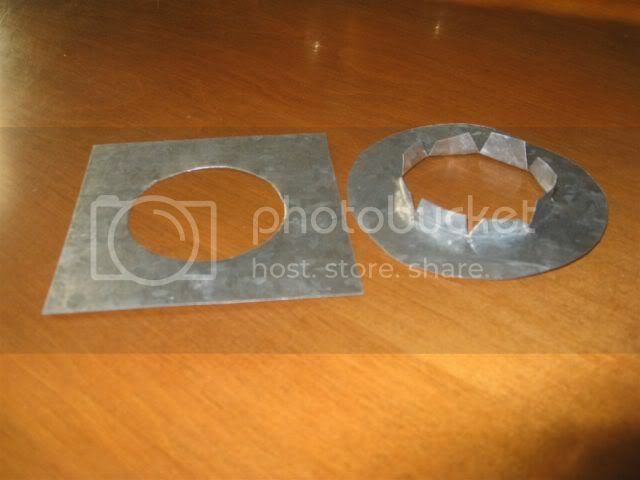 The tarp pipe hole is cut like a pie and sandwiched between the two plates, then the tabs are bent around the bottom plate to make a polygon shaped hole for the chimney. Winter is not the time to go streaking!! !